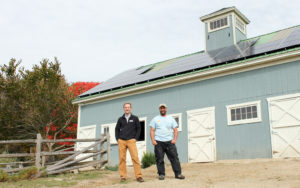 Chip Means from Pika Energy (left) and Gifford Jenkins-Davis of ReVision Energy (right) in front of a battery-ready solar home in Durham, Maine, powered by Maine-made Pika Energy electronics installed by ReVision Energy. As we mentioned in the previous chapter, a lot of progress has been made in the technologies that are involved in solar electric power production. The area of batteries is no different. Just a few years ago, the cost and challenge to integrate battery systems with a solar electric array meant that unless there was a specific use case—remote location, critical 24/7 electric loads—we would often advise a customer against adding battery storage. Simply put, a grid-tied solar array (dependent on the grid with no on-site battery backup) was simpler, more reliable, and a better overall investment. But, technology changes quickly! Elon Musk’s 2015 announcement of the Tesla Powerwall—and more recently, the Powerwall 2—has invigorated consumer demand for solar + storage products. Currently, there is a technology ‘arms’ race going on, as many vendors compete to develop the energy storage solutions of the future. As of 2016, every solar electric system we are designing and installing is ‘forward compatible’ with storage, whether or not a battery pack is installed at the time of the solar installation. Not only can these “solar batteries” keep the lights on when the sun or grid is down, but they can also support the utility grid by filling intermittent gaps in renewable energy production when clouds pass over or the wind subsides. 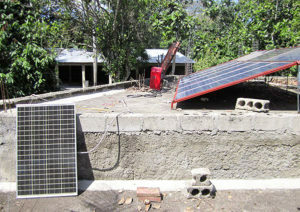 Historically, battery-based systems only made sense in extremely remote areas, such as this system that ReVision Energy designed for a hospital in Milot, Haiti. Before the popularization of the grid-tied inverter in the late 1990s, all solar energy systems were independent of the grid; this is what it means to be ‘off the grid’ – literally not connected to the utility grid. In this era, if you wanted to have power after the sun had set, you had to have a battery of some kind to store the energy, usually a big bank of ‘golf cart type’ lead-acid batteries. Fast forward twenty years and, at least in the US, the vast majority of solar energy systems no longer use batteries at all; instead taking advantage of the utility grid and net metering to export excess electricity when the solar production exceeds the load, and to import electricity back from the grid when the loads exceed production. Grid-tied solar electric systems work great and are a real win-win for both the solar customer and society at large. The solar customer benefits by having the advantage of using the grid as storage. Society benefits because solar customers typically export excess electricity to the grid at periods of high wholesale prices and peak demand, and import power at periods of low wholesale prices and low grid demand. 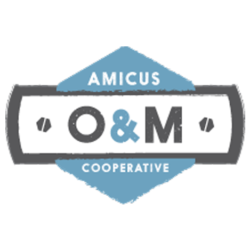 This is a market benefit above and beyond the obvious environmental benefits of solar (documented in studies such as Maine’s own Value of Solar). Grid-tied solar energy’s rapid growth has been fueled by staggering drops in equipment cost, roughly 75% over the past 10 years. And though batteries have not experienced the same meteoric progress in performance and cost, many industry observers think it is only a matter of time. Investment in battery R&D is growing worldwide, thanks largely to surging popularity of hybrid and plug-in electric vehicles, and the distributed solar industry is well poised to benefit from those investments and economies of scale created by that market. Whether it’s the Tesla PowerWall, cell phone, cordless drill power-pack or golf cart battery, the basic concept is the same: a charged battery stores electrical energy in chemical form for later use. In most renewable energy applications, a special class of battery, deep cycle batteries, are required, as the constant discharge and recharge of the battery requires more durable construction (in contrast to your car’s battery, which is used for a short burst of energy before it is quickly re-charged by your alternator). Energy Capacity: Maximum electric usable energy (kWh) stored in a battery. Maximum Discharge and Charge rates: The peak power—usually given as maximum current—the battery can either provide or accept without damage. Depth of Discharge: What % of the battery’s capacity may be used before it needs to be recharged. Cycle Life: How many recharge cycles a battery can undergo before it reaches end of life. Calendar Life: How long, in time, a battery can be expected to last before it reaches end of life. Energy Density: How much energy is stored per unit of volume. Specific Energy: How much energy stored per unit of mass. Energy density and specific energy are related but distinct. For example, a battery with the same energy capacity may be large and heavy (low energy density and low specific energy), large and light (low energy density but high specific energy), small and heavy (high energy density and low specific energy), or small and light (high energy density and high specific energy). Temperature Limitations: The acceptable operating temperature range of a battery. Some battery chemistries may not operate below freezing temperatures, or at very high temperatures, for example. Others generate significant heat either while charging or discharging and thus may need an active thermal management system to keep them from overheating. Self Discharge Rates: The rate at which a battery loses charge while not producing energy. Can I Use a Solar Powered Battery Pack instead of a Generator? Power outages due to extreme weather events are increasingly common across New England. The increased frequency of extreme weather events in New England (which scientists link to the effects of increasing carbon pollution in our atmosphere), together with our increasing reliance on electronics in the home has led many New England homeowners to install fossil fuel powered backup generators to provide assured power in the case of a grid outage. 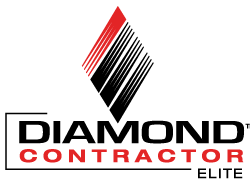 Many homeowners also are concerned about the threats of cyber attacks or terrorism on grid infrastructure (e.g. 60 Minutes). Hundreds of thousands of generators are sold across the United States each year, the majority of them dirty, inefficient, gas-burning portable backup generators sold at big box stores. For the homeowner seriously considering a propane or gas powered standby generator, the economics and power properties of a solar-powered storage solution can be quite attractive. While a generator can provide power for everything, for a limited period of time, a solar + battery solution can provide power for the essentials, for a near unlimited period of time. ¹ Installing energy storage provides some mitigation of risk associated with future Net Metering uncertainty and other rate design risk by allowing a customer to maximize self-consumption, minimize demand charges or optimize energy use patterns for a possible Time of Use rate. ² Net Cost: Assumes storage is charged by a solar energy system and so is eligible for the 30% federal tax credit. Price range reflects various sizes of batteries and power capabilities. While there are some limits to its power output capabilities, the battery pack is infinitely cleaner, can run indefinitely under proper design circumstances, has no recurring maintenance needs, and offers a range of capabilities—such as ‘self-consumption’ of solar power and grid support services—not offered by generators. As technological evolution and fierce competition push down the sticker price of battery backup units, we expect the next 3-5 years will show a seismic acceleration in the adoption of home-based battery systems. Wondering if going solar is the right decision for you? Add your home or business location in the box below and take the next steps toward a sunnier future!